April 20, 2011 - Rockwell Collins introduced its HGS 3500, the industry’s first Head-up Guidance System (HGS) available for light to mid-size business aircraft. The announcement was made at the 56th Annual Corporate Aviation Safety Seminar (CASS) in San Diego, Calif. The new HGS-3500 empowers flight crews to achieve greater precision at all times by presenting information in the pilot’s forward field of view, eliminating the need to continually transition from head-down instruments to a head-up, out-the window view during critical phases of flight. 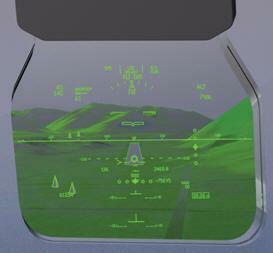 Exclusively available for aircraft equipped with Rockwell Collins Pro Line Fusion™ avionics, the high degree of integration between the HGS-3500 and Pro Line Fusion makes it possible to display synthetic and enhanced vision images directly on the head-up display (HUD). This advanced capability available only on Rockwell Collins HGS further increases situational awareness and safety. “Commercial airliners and large business aircraft have confidently flown with our HGS for more than 25 years. We applied this vast experience along with our strong expertise in display and optics technology to create a compact, breakthrough system that brings this advanced capability to thousands of aircraft that never before had access to the safety benefits of head-up flying,” said Greg Irmen, vice president and general manager of Business and Regional Systems for Rockwell Collins. The Rockwell Collins HGS-3500 features an innovative, all-in-one hardware design optimized to easily conform to the structure and aesthetics of the flight deck of light- to mid-sized business aircraft. The system uses substrate guided optics to project the forward field of view image through the HUD via an optical waveguide. Rockwell Collins has delivered more than 3,500 HGS to customers around the world, making it the leader in head-up display (HUD) technology. The Rockwell Collins HGS-3500 will be on display at the 11th Annual European Business Aviation Convention & Exhibition (EBACE) in Geneva, Switzerland, May 17-19, 2011. A 2009 Flight Safety Foundation study concluded that HGS technology would have positively influenced the outcome of hundreds of accidents over a 12-year period. The study found that 38% of all accidents were likely or highly likely to have been prevented if the pilot had a HGS. The study also came to the conclusion that a staggering 69% of landing and takeoff accidents and 57% of loss of control could have been avoided if the pilot had access to the information available on a HGS. To read the complete study, click here. Rockwell Collins is a pioneer in the development and deployment of innovative communication and aviation electronic solutions for both commercial and government applications. Their expertise in flight deck avionics, cabin electronics, mission communications, information management, and simulation and training is delivered by 20,000 employees, and a global service and support network that crosses 27 countries.